Bhujangasana is a part of the sequence of yoga postures in Surya Namaskar or Sun Salutation. The meaning of Bhujang is cobra and asana means yoga poses. Bhujangasana is the last stage when the cobra is ready to attack its hunter with its hood raised; hence the name is cobra pose. Cobra Pose is a back-bending yoga asana, which has many health benefits which ranges from head to feet. 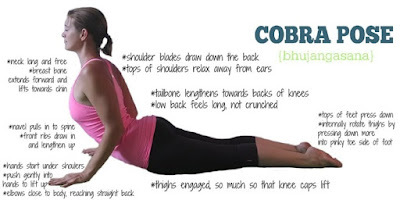 Cobra pose and its variation are helpful for lower back pain which originates in the spinal column. Bhujangasana is a quite easy pose and doesn’t need much physical strength but it depends on the flexibility of your back and spine. This posture can be done in the comfort of your own home with a simple yoga mat and can be done at any time of the day. Note: Beginners and people with neck pain had to maintain their gaze toward the floor. Those with more flexibility can bring their gaze to the sky. Start lying on your belly and your toes flat on the floor and forehead relaxing on the ground. Place your hands (palms facing downwards) under your shoulders, keeping your elbows parallel and close to your torso. Take a deep breath in, gently lift your head, chest and abdomen while keeping your navel on the ground. Lift your torso back and off the floor using support of your hands. Make sure you are using equal pressure on both the palms. Keep breathing with awareness, as you curve your spine vertebra by vertebra. If manageable, straighten your arms by arching your back to the max. Lean your head back and look up. Assure that your feet are still adjacent. Carry smiling and breathing. But don’t overdo the stretch or hurt yourself. Breathing out, smoothly bring your abdomen, chest and head back to the floor. This stretch opens up the shoulders and neck. Firms and Tones the abdomen. Strengthens the chest and shoulders. Do not practice Bhujangasana, if you are suffering with fractured ribs or wrist injuries or experienced from any abdominal operations recently. Avoid practicing Cobra Pose if you are pregnant. Perform this pose under yoga master’s guidance if you have experienced any chronic diseases or spinal disorders in the past. Bhujangasana is a great way to stretch muscles in the shoulders and chest. It strengthens the arms and also helps treat constipation. It counteracts a long day of sitting in front of a computer, driving, or traveling. By bringing more flexibility to your spine will help you to feel balanced more, while opening your heart and chest also energize and rejuvenate you throughout the day!